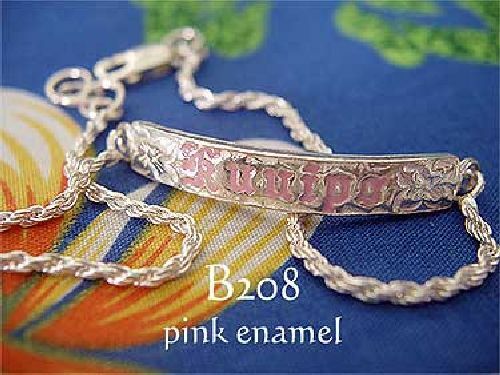 Sterling Silver Hawaiian Plumeria (frangipani) love Bracelet, featuring a 35mm long by 6mm wide bar with hand carved flowers and a pink enamel inset engraving of the word �Kuuipo�, which is Hawaiian for love. Either side is diamond cut rope chain. Secured with a strong lobster clip. This Hawaiian jewelry bracelet measures 8 inches, 205mm in length with links to downsize by 7mm. Also available to order with black enamel lettering, or plain silver. Please ask.